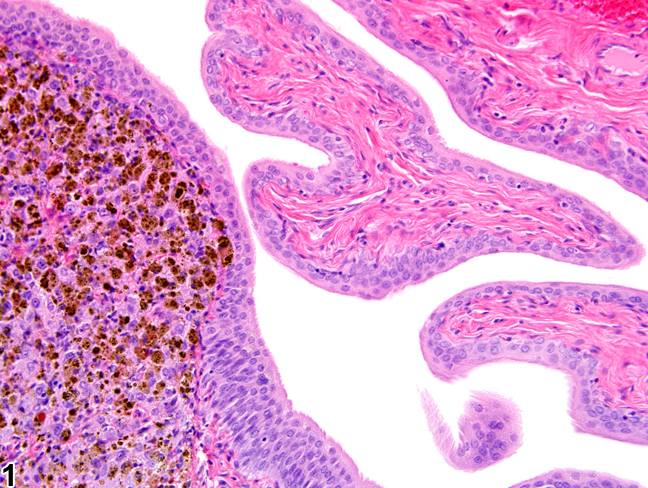 Pigment-a focal area of hemosiderin from a female F344/N rat in a chronic study. Pigment is rarely reported in urinary bladders of rodents. The most common pigment is hemosiderin ( Figure 1 ). Pigmentation of urothelium has been observed with administered dye compounds. Pigment should be diagnosed and given a severity grade. With the exception of Prussian blue staining for hemosiderin, definitive pigment identification is often difficult in histologic sections, even with a battery of special stains. Therefore, it is recommended that a diagnosis of “pigment” (as opposed to diagnosing the type of pigment, e.g., hemosiderin or lipofuscin) is more appropriate. The pathology narrative should describe the morphologic features of the pigment.